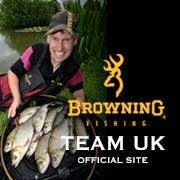 A few of weeks ago myself and Chris Moorhead, a fellow Browning angler had the pleasure of doing a feature for Angling Times at Wholsea Grange Fishery. For those who have never been to Wholsea Grange, there are 3 beautiful well stocked lakes to choose from. 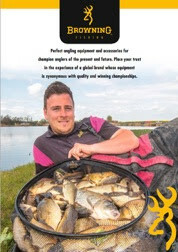 All the lakes contain a massive array of species, with something to suit almost every angler. On the day we selected the Middle Pond, which is extremely picturesque with lilly pads and islands everywhere. Almost every peg on the lake has a feature to fish too. Peg selection for the day was based on the photographer been able to get the best pictures possible. We chose pegs 28 and 29, as these offered plenty of scope. I opted for peg 29 which has loads of features on offer, the first being a reed fringed island at 13 meters. There is also a large lilly bed to the left of the island. The margins also offered plenty of options with a over hanging tree to my left hand side and lovely shallow margin to my right. I planned to start with a line at around 11 meters close to the Lilly pads directly in front of me on the deck, then swap to a shallow rig later in the session. I also plumbed up a line to the left of the lilly pads, should the fish back off. The depth was identical on both lines enabling me to utilize the same rig for both. My main attack was based on fishing 6 mm cubes of meat, both on the deck and shallow. All feeding was done via catapult. I also had a few pints of maggots as back up if the meat did not produce. Hook - Size 18 Kamasan B911 eyed, tied with a knotless knot with a hair rigged micro band. I had 2 rigs set up one at 12" and 1 at 18". The reason behind this is so that there is minimal line between the pole tip and the float, which reduces missed bites. I started the session on the deck rig with a 6 mm cube of meat on the hook. Before shipping out I catapulted 2 lots of 10 cubes then shipped the rig out and lowered it in slowly, trying to mimic the falling freebies. It didn't take long before the float buried and the hooked fish headed straight towards the Lilly pads. After a bit of a tussle I managed to guide the fish away into the open water and eventually into the landing net. A Small, but perfectly conditioned Carp was the reward. I had a couple more fish, including a cracking Ide before a torpedo carp dragged me through the lillys smashing my rig. Unfortunately this seemed to unsettle the swim and I couldn't get a bite. 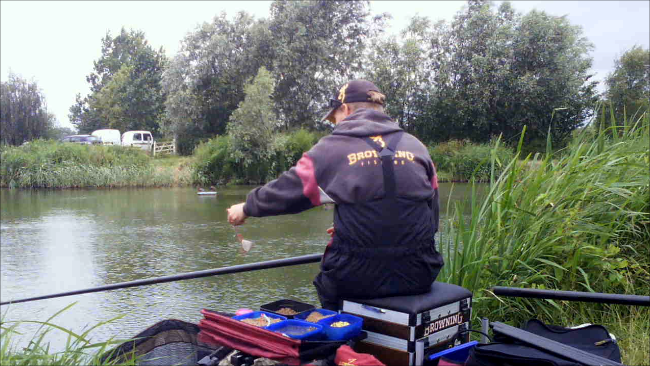 A switch to the shallow rig helped slightly as two Ide on the bounce ended up in the net, then this line went quiet. Had the fish backed off? I decided to start feeding the other line to the left of the lilly pads, this resulted in a couple of small Carp in quick succession. Bites then disappeared, but I started to notice signs of movement up in the water so I switched to the shallow rig hoping for an instant response, but I was left hoping as the bite never materialised. I decided to put the catapult away and put a pole mounted pot on and concentrate on the deck rig. This resulted in fish coming thick and fast. The only downside was that I was struggling to keep the Carp away from the lillys. I swapped the Z12 for the Xtreme Margin Pole and a much heavier elastic. This did the trick as I managed to get through the remainder of the session with no more chaos. I ended the session with a good few Ide and a shed load of Carp. 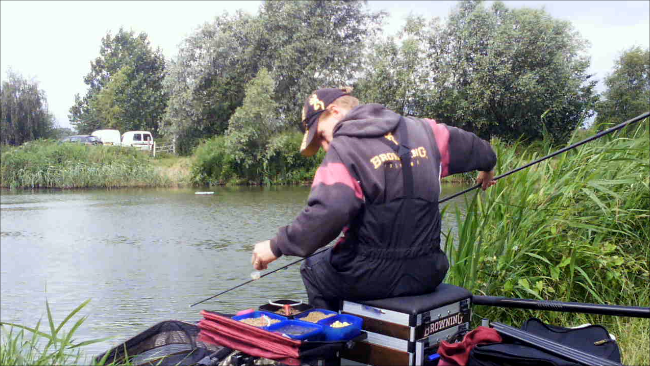 Chris's approach was contrasting to mine and was based on fishing maggot on the hook and feeding lots of them by big potting on a regular basis. With this approach Chris hoped to target the huge amounts of Ide present in the lake. It worked really well too, but with feeding plenty of bait the inevitable happened and the Carp soon got in on the act too. Chris's final net was much more evenly split than mine as he caught alot more Ide than I did. It was a brilliant day and we both caught loads of fish with different approaches, proving just how good this fishery is. If you have never been before, I hope this inspires you to go and give it a visit! Thinking back it must be at least 10 years since I set eyes on this venue, I didn't know quite what to expect; I was hoping not much had changed over the years. On arriving at the venue I noticed for starters that peg numbers had diminished, probably due to flooding and neglect over the years. But apart from that the drain looked almost the same as it did all them years ago. This was once a popular match venue with large numbers of anglers attending the matches. Over the years with the venue having been polluted on a number of occasions and the introduction of commercial venues, angler numbers have declined to almost non existent levels. It is situated approx 9 miles (14km) South-East of Hedon, East Yorkshire and 4 miles South-West of Withernsea on the A1033 road. I drove through Patrington Haven Village and over the bridge and turned down Outstray Road immediately left which runs along side the drain. The road ends after roughly a mile and a half and there is a car park for a few cars. I parked my car there and had a little wander. Immediately in front of the car park there are a couple of pegs, but one of these was already occupied. Just to the rear of the car park is a gate with a foot path to the side. I went round the gate and about 30 meters up the road was a nice looking peg. Happy days, this was to be my peg for the session. As the banks are quite steep I decided to plumb up both short and long with the plan to start short and swap to long if the fish did not respond on the short line. Fortunately the drain was extremely uniform so one rig would cover both areas. 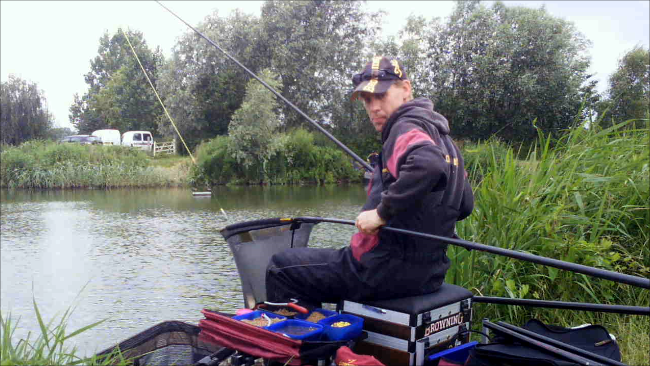 I started the session by feeding a single ball of ground bait via a pole cup along side a few loose maggots. I lowered the rig in slowly and fed a few maggots over the top by hand. It must have been 10 seconds before the float disappeared, resulting in a lovely little Gudgeon. The next couple of drops resulted in a Perch and a Roach. It was great to see the drain was still full of fish. As the session went on bites gradually started to slow down. I found topping up with a small ball of ground bait soon got the fish queuing back up again. After an hour I took my net out for picture purposes and I must of had nearly 10 pound of fish in that short period of time. I was relieved to have finally gotten my fix of Lindholme Lakes last week, as I have had a busy few weeks, which has restricted me going; It felt like my arms had been chopped off, and severe withdrawal symptoms were beginning to kick in! The match was held on Willows Lake, which is full of F1s, Carp and Barbel plus shed loads of Silvers. I have had some really good days on here in the past, so I was really looking forward to the match. At the draw I pulled out peg 23, which is on the 3rd spit on the left hand side of the lake. The peg is close to the end of the spit, offering plenty of space. The only downside was that the wind was blowing down to the opposite end of the lake. I opted for a quite a simple 4 line attack; first of all a short line at a top 2 plus 2 distance on the deck. The second line was to be on the deck at 13 meters, I also set up a shallow rig to fish over the top on the same line, as the fish tend to come up in the water very quickly on this lake. The 4th line was for the margin to my left. For the top 2 plus 2 line I planned to feed softened fishery micros through a kinder pot and fish corn on the hook. Since meat has been banned, this is something I have done and had some really good results. 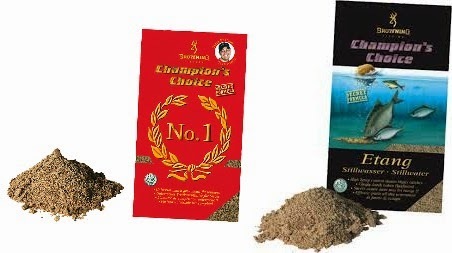 For the 13 meter line I planned to feed 6 mm fishery feed pellets via catapult for the deck rig and once the fish come up in the water, switch to 4 mm pellets as this size pellet tends to get a better response when fishing shallow. For the margin the plan was to feed hemp by hand and fish either corn or worm over the top. compressed them with my thumb, so that they dropped out of the pot in a clump. I like to do this as helps to get the bait down quickly, maximising fishing time. For the hook I baited up with a single grain of corn. I shipped the rig to the desired spot, tapped the micros from the pot then lowered the rig over the top. I instantly got an indication, but the bite did not materialise, so I lifted and dropped a couple of times, which provoked a reaction and I was into my first F1. I had a good 30 minutes on this line before bites started to slow down. I had been constantly feeding the 13 meter line with 6 mm pellets via catapult and had started to notice signs of fish feeding shallow in the swim so I swapped and started feeding 4 mm pellets. I baited the shallow rig with a 4 mm hard pellet and shipped the rig out. A couple of quick slaps with the rig soon saw the rig disappear and a steady stream of yellow elastic omit from the pole tip. An F1 around the 2 lb mark was the result. I had a good couple of hours on this line before bites became iffy. I swapped back to the short line that I had been constantly feeding with small amounts of pellets, to give the long line a rest. This resulted in a quick run of fish including 2 kamikaze Bream, which must have launched themselves 4 feet out of the water. The next hour or so was spent swapping between these 2 lines to keep fish coming at a steady rate. From the 3rd hour of the match I had been constantly feeding the margin with handfuls of hemp seed. The remainder of the match was spent rotating lines, which helped me continue catching right until the end of the match. With an hour to go I had started to notice swirls after feeding, so I shipped in the shallow rig, swapped the pellet to a 6 mm, quickly fed, then dropped it in on the margin line. The response was instant and a decent F1 was the result. This was followed by half a dozen more before this line went quiet.